The RM Sotheby’s Auction at Amelia Island takes place March 10 2018 at the Ritz Carlton in Amelia Island, Florida. RM Sotheby’s managed to secure an amazing collection of Porsche 911s to come up for sale, many of them coming from the same collector. This might be a good opportunity for a Porsche collector who is looking to add some collectible Porsches to the collection. You can see the complete list of Porsches that cross the block in the RM Sotheby’s Auction on the last page of the article. We’ll focus here on a few of the gems that are auctioned. One of 55, the 1993 Porsche 911 Carrera RS 3.8 (model 964) is a car one should think not coming up for sale a lot. 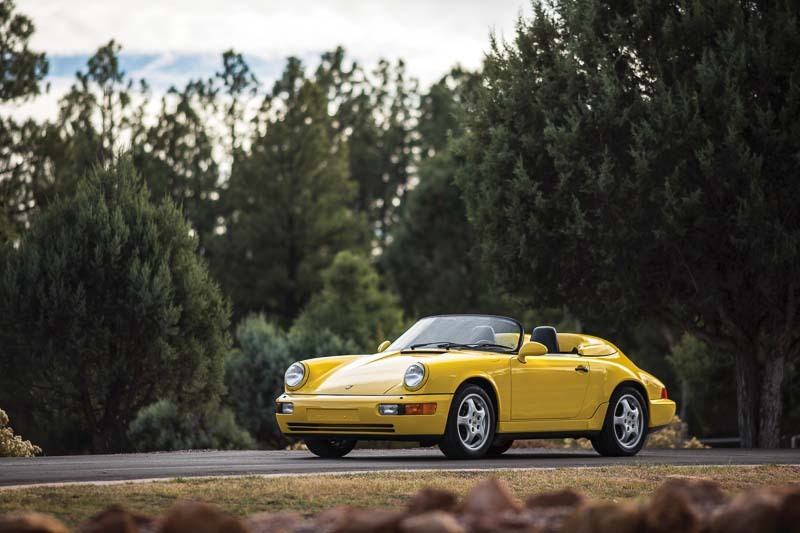 However, the last few months a few have 993 model Porsche 911 Carrera RS 3.8 popped up in an auction, recently in the RM Sotheby auction in Scottsdale. This left-hand-drive example appears to be the second-to-last RS 3.8 completed. It left the factory in late 1993, one of the 12 ordered in Speedgelb. The car has only 6825 kilometers on the counter, which makes it even more desirable for collectors. Btw if you need to know more about the car, the Porsche 964 Carrera RS 3.8 book is a good start. One of 469 North American examples, this Ferrari yellow Porsche 911 Speedster has only driven just over 21.000 miles. The car is now in the collection of a prominent Porsche collector. It has been properly maintained in all respects and driven on a regular basis to ensure that it is in proper working order. Recently serviced by a trained Porsche technician, it is supplied with its correct tool roll, electric inflator, manuals, and period sales materials. Even though the number of 469 cars produced , makes this car not the rarest of the rare, it still is a limited production car you won’t cross often. It will definitely find a new owner.